Sony has launched a range of 3D-friendly home cinema systems capable of receiving and passing on 3D Blu-ray video signals. Never mind the specs, one of the major irritations of 3D for many home cinema enthusiasts is that the HDMI inputs on their existing amps are unable to handle the 3D signal from a Blu-ray deck and pass it through to a 3D compatible screen. 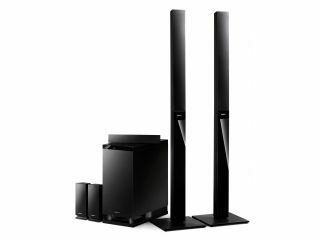 It's good news, then that Sony new line-up comprises two surround sound/amplifier combis – the HT-AS5 and HT-AF5 – and the BDV-470SS, a complete system that adds a 3D Blu-ray player. The implementation of a 3D pass-through means that the 3D signal from a Blu-ray deck can be fed to a 3D TV screen via the home cinema system, allowing the amplifier to decode the hi-res audio formats carried on most 3D Blu-rays. Each system is powered by a 1,000W S-Master digital amp hidden in a compact subwoofer/control centre. Other common features include Audio Return Channel, dual optical/single coaxial digital audio inputs, 7.1-channel LPCM compatibility, auto-calibration and Sony's Digital Cinema Sound processing. Slim, compact speakers are used for front and rear channels, the HT-AS5 using the same speakers all round, while the HT-AF5 has tall floorstanding front left and right channels for a bigger sound. The BDV-470SS all-in-one package combines a BDP-S470 3D Blu-ray Disc player with a HT-AS5 surround sound system. Additional features include DLNA multi-media networking and Sony's impressive BRAVIA Internet Video platform. The HT-AS5 is available from Sony's online store for £400, the other two models have an impending UK release date, but prices have yet to be announced.